This last week I was asked to write a series of prayers. Then I sat down to write them and I froze. I didn’t know what to write. I didn’t know how to pray. My words seemed inadequate. Not pretty enough. Not spiritual enough. But I didn’t find them helpful. The first prayer on the list was a prayer for healing. My idea of what a perfect prayer is, has made me mute. My next step was to tell myself to calm down, to remind myself that prayer isn’t a magic wand. I took a deep breath and reminded myself that prayer is simply a conversation with a friend. I do that sometimes, I turn prayer into something difficult, something mystical but I don’t think God ever intended it to be. Do what’s best—as above, so below. That’s the perfect prayer Jesus came up with. I wonder if I stood in the audience that day if I would even have heard Jesus fumble for a word too, pause, while he thought about what to say next. In my mind the Lord’s prayer has become so polished, so perfected that my own mumbling prayers even when short and simple seem inadequate. 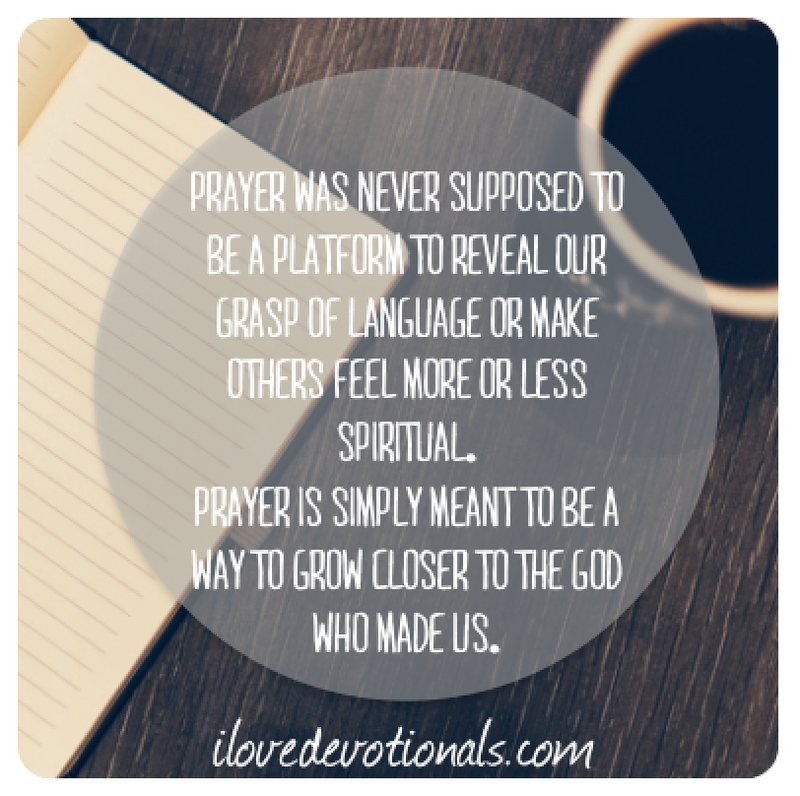 After all, prayer was never supposed to be a platform to reveal our grasp of language or make others feel more or less spiritual. Ponder: Has your idea of what a perfect prayer is kept you from speaking to your Father in heaven? Prayer: Our Father in heaven, reveal who you are. Set the world right; do what’s best—as above, so below. Keep us alive with three square meals. Keep us forgiven with you and forgiving others. Keep us safe from ourselves and the Devil. You’re in charge! You can do anything you want! You’re ablaze in beauty! Yes. Yes. Yes. Please share this devotional on twitter by clicking here. I’d also love for you to connect with me on my Facebook, pinterest and twitter pages or if you're viewing this via email you can leave a comment by clicking here.